​When your team is on a roll, it feels like every single play goes your way. That's no different for the ​Oklahoma City Thunder. They've won nine of their last 10 games, have won four in a row, and sit just 1.5 games back of the second seed in the Western Conference. This beautiful save-and-slam by Steven Adams and Paul George is just one of those plays that goes right. 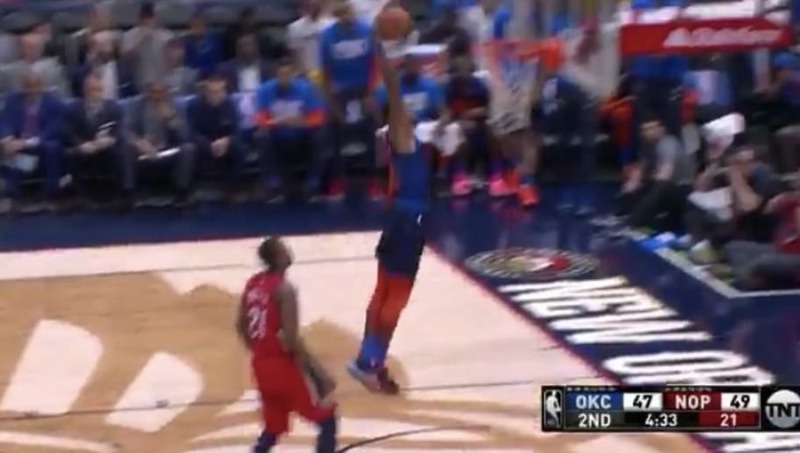 ​​Adams saved the ball from going out of bounds on the steal attempt and George capped it off with a vicious dunk over New Orleans Pelicans forward Darius Miller. George is in the midst of an MVP-caliber season, averaging 28.7 points, 8.0 rebounds, and 4.1 assists per game for a 37-19 Thunder team. Even teammate and former MVP ​Russell Westbrook recognizes that George is playing out of his mind. "In my opinion, P has been very consistent," Westbrook said of his teammate. "He's definitely the front runner for my MVP." George has been invaluable on both ends of the court this year, posting an offensive rating of 119 while coming in at a solid 103 defensive rating. Should the Thunder make any noise in the playoffs this year, it will be on the coattails of George and his stellar play.